A downhill tee shot leaves a short iron to a green protected by a large Oak tree. The bigger hitters can attempt to drive the green but beware of the out of bounds on the right! Only a short iron is required to a virtual island green, block the water out of your mind and you’ll be rewarded with a birdie opportunity. 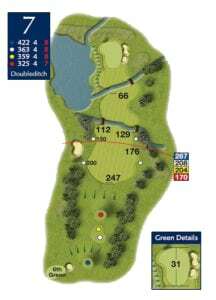 A well position tee shot to a tree lined fairway leaves an imposing second shot over two lakes to a raised green. A par here is well deserved. A short dogleg left to right. An iron off the tee will leave a short iron to a large green protected by three large bunkers. The more aggressive can hit driver but beware of the out of bounds to the left! A long par 4 with two large well positioned bunkers off the tee. Finding the fairway is a must with a long second shot to the green. One of the most difficult holes on the course. A drive over an Oxbow lake to a fairway protected by a large bunker on the left. The green is cut into a hill resulting in the most challenging putting surface on the course. 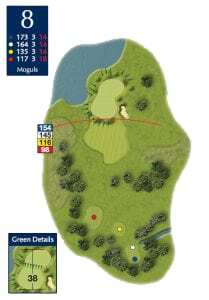 Big hitters will attempt to hit it in two but will be left a very awkward approach if the green is missed. 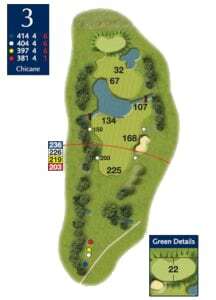 A lay up tee shot in front of two ditches leaves a mid iron to a green protected by a lake and two bunkers. This hole will test your accuracy. A tough two tiered green is protected by water on the left and a bunker on the right. A tee shot nestling in the middle of the green is a welcome sight on any day. An uphill tee shot on this long par 4 must stay clear of the copse of trees on the right. This leaves a testing uphill second to a green protected by a bunker on either side. A great hole.